At CBC we have a long established relationship with Douwe Egberts and are an exclusive distributor of their Cafitesse range of machines and Liquid Roast coffee products. 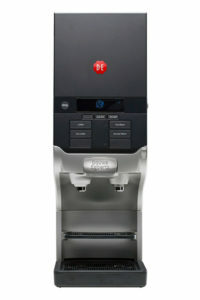 We can guarantee that the Cafitesse/Liquid Roast combination is probably the fastest coffee machine on the market and is ideal for both self-service and served environments such as conference and meeting rooms, offices, breakout areas, cafes, restaurants and hotels. With a top dispense rate of 600 to 1,000 cups per hour, the range offers speed, volume and quality producing fresh coffees, perfectly brewed in seconds, time after time, whilst keeping costs to a minimum. Some models also offer tea and chocolate options. 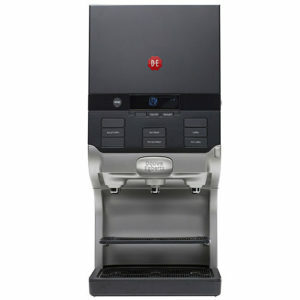 The secret of the high volume coffee system lies with the unique way that Douwe Egbert blend, roast, brew, pack and then quick freeze the liquid coffee. The flavor is then locked in until the moment the pack is used in the Cafitesse machine. It goes without saying that you can rely on Douwe Egberts for the quality and consistency of their coffee. There are a range of models in the Cafitesse range with different capacities /specifications which are all available on a ‘free on loan’ basis. Each of their machines is compact, good-looking and user-friendly, and comes with on-site, hands-on system training for every model of machine. The machines are very simple to operate and require minimum maintenance.